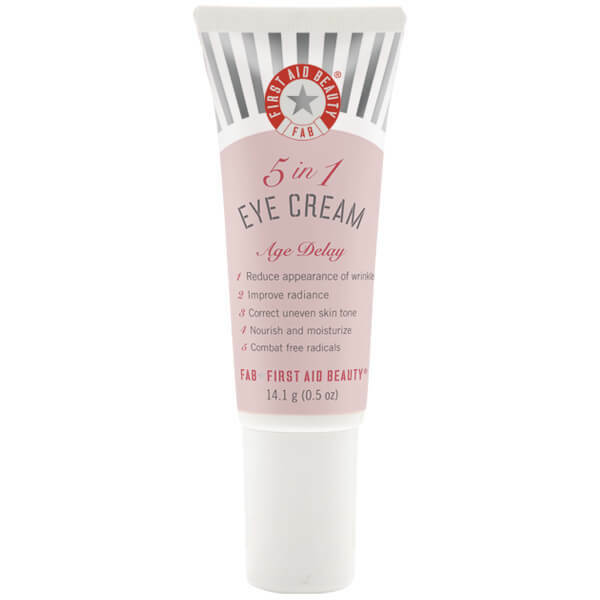 Reenergise your eyes with the First Aid Beauty 5-in-1 Eye Cream. Ideal for all skin types, its moisturising, anti-ageing formula combines soothing bisabolol with brightening alpha arbutin to effectively care for and revitalise your eyes. Ultra-nourishing, the cream helps reduce the appearance of fine lines and wrinkles around the delicate eye area whilst firming, brightening and evening out skin tone. Expect hydrated eyes with a youthful radiance. - K.N. 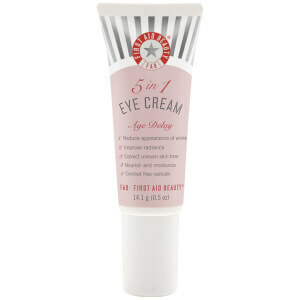 Apply sparingly with ring finger to entire eye area using a gentle patting motion. Be careful not to get the product directly in the eye. Water (Aqua), Glycerin, Dimethicone, C12-15 Alkyl Benzoate, Sodium Polyacrylate, Ethylhexyl Palmitate, Silica, Hydrogenated Lecithin, Caprylyl Methicone, Sodium PCA, Phenoxyethanol, Phenyl Methicone, Enteromorpha Compressa Extract, Hydroxyethyl Acrylate/Sodium Acryloyldimethyl Taurate Copolymer, Retinyl Palmitate, Camellia Sinensis Leaf Extract, Glycyrrhiza Glabra (Licorice) Root Extract, Chrysanthemum Parthenium (Feverfew) Extract, Polysilicone-11, Alpha-Arbutin, Sodium Hydroxide, Xanthan Gum, Caesalpinia Spinosa Gum, Sodium Benzoate, Potassium Sorbate, Glyceryl Polyacrylate, Bisabolol, Niacinamide, Tocopherol.